The first knife I ever owned, even before my Swiss Army knife, was a Gerber that my Dad gave me. It awed me then and awes me now, and is being passed down within my family; hopefully for generations to come. When a couple of military buddies mentioned the Gerber Applegate Fairbair Covert to me as a “must have” for my collection, the were sure to mention the rich history of knife’s designers. I’m not crazy about tricking out a knife with logos and what not, but if you’re going that route they may as well be the signatures of some pretty accomplished dudes. Mission accomplished with the Covert. Both Colonel Rex Applegate and William E. Fairbairn were pioneers in close quarters armed and unarmed combat. Colonel Applegate was even inducted into the Blade Magazine Cutlery Hall of Fame at the 1994 Blade Show. Look them up some time and you are sure to be impressed by their accomplishments. The Covert has an overall length of 8.75″, a 3.75″ blade, weighs 4 ounces, and is made in the USA. A significant challenge in the tactical folder market seems to be balancing weight and size with concealability, and to do this without losing the knife’s function. The Covert walks that tightrope nicely. With a full 5” handle, it accommodates even large hands. One would think that would lead to a noticeable weight in your pocket, but the 4 ounces feels extremely light in hand and becomes an afterthought in the pocket in no time. And if you are really size sensitive, Gerber also offers a Mini Covert with a 2.92 inch blade and weighing in at a mere 2.2 ounces. 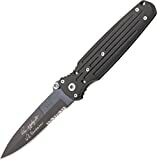 The blade itself is .125” thick, and include signatures of its creators and “USA” proudly stamped under the Gerber logo. The spear point blade features a double bevel and serrations running halfway down the sharp side. The opposite edge could be sharpened to suit the owner. I’ve never been motivated to do so, but could see that being an option since this is a folding knife designed for hand-to-hand combat. The Covert comes with a titanium nitride coated 154CM stainless steel blade, a nice departure from Gerber’s usual lineup of 420HC blades. 154CM is a great working steel that is reasonable to sharpen yet still good in the edge retention department. Seeing how this nice retails for close to $100, 154CM was an appropriate choice given the price. The words “Glass Filled Nylon” (GFN) do not give justice to how the Covert feels in the hand. The material is dense and of high quality – it does not feel like “cheap plastic”. Many manufacturers use GFN and when you pick it up its clear why the choice is popular. GFN holds up well to abuse and can be molded into a near-infinite variety of shapes and textures. This one is ribbed for my pleasure, and bears a surface that’s easy to grip without catching on your favorite pair of jeans when removing it from the pocket. The GFN itself is semi-smooth with the texture of a medium grit river rock and almost seems temperature neutral regardless of conditions. I know this knife isn’t going to slip out of my hand and don’t have to worry about blisters with extended use (as unlikely as extended tactical use is). About three quarters up the length of the handle you will find ambidextrous finger choils with mild jimping. This knife was designed with combat use in mind, and the simple handle allows for the user to work with the covert in forward and reverse grips. The finger notches provide an anchor point that give that extra bit off assurance and make for an overall high quality fit in the hand. The clip falls short. It’s a decent size and sits in your pocket at about the right height, but allows for ambidextrous tip down carry only. Happy days for those of us that are tip down users. The rest of us will have to get over it or find another blade. One other point regarding the clip, and I’ll let it rest: I’m sure this is just an offshoot of the fact that nearly all of my clips are situated near the pommel, but the clip is bothersome when holding the knife for general use. The clip is my least favorite feature of the Covert by a long shot. The Covert uses ambidextrous thumb studs for deployment. Personally, I love having thumb studs. The Covert’s thumb studs are accessible without being in the way, and they also serves as an external stop pin. This folder flicks open easily with a little wrist action. It glides open to a secure liner lock that is perfectly centered on my model. One thing I want to mention here is how well balanced the blade feels both while being snapped open and afterwards. Balance was obviously something the Colonel Rex Applegate and William Fairbairn wanted to be perfect. They achieved that goal. The Covert features a liner lock with an external safety, called the “roto-lock”. The roto-lock is similar to CRKT’s Auto-LAWKS system, and requires the manipulation of a small lever on the spine of the handle prior to closing the blade. The locking mechanism naturally falls into place as your fingers find the deep finger choils and jimping. You pull the lever back (away from the blade) to disengage the liner lock. Although the liner lock and roto-lock are both made of relatively thin steel, everything is solid and exudes confidence. While I am not a huge fan of external safeties, I can see how this would make sense for a combat knife. I honestly didn’t want to like this knife. Any time somebody puts a giant signature on the face of a blade it just rubs me the wrong way. I am also not a huge fan of the clip. My preferred blade carry position is tip up and I have to retrain myself when I decide to carry the Covert. This may not be a problem for some of you, and certainly not for folks that commit to one blade for universal everyday carry. I’m not that guy. For that reason, this knife doesn’t find its way into heavy normal rotation. All that said, it didn’t take long for me to overcome those pet peeves when handling and using this knife. It just flat out does what it is designed to do and performance trumps aesthetics. I am glad I own the knife and many friends and colleagues seem to be drawn to it. I have every confidence in the workmanship of the blade and moving parts and really appreciate how it feels in your hand. I see it being a love-hate kind of knife depending on what features matter most to the buyer. Cost is always a factor and while the MSRP is $182, it’s readily available for under $100. Gerber makes a ton of inexpensive, low quality blades in the lines they offer from overseas. The big retailers demand this (and so do consumers) and you can’t argue with demand for throwaway knives. The “Made in the USA” line appears to follow tradition of craftsmanship and attention to detail of old. If you’re a right handed, tip down carrier or if that isn’t a stumbling block, you should buy this knife. It may actually be a go-to tactical recommendation for those of you in that camp. Regardless, you won’t be disappointed with the functionality of this balanced and functional folder designed by two of the biggest names in hand-to-hand combat training. I recommend purchasing the Gerber Covert at Amazon or BladeHQ. Please consider that purchasing anything through any of the links on this website helps support BladeReviews.com, and keeps the site going. As always, any and all support is greatly appreciated. Thank you very much. I’m curious about the external lock. It appears that depressing the tab on the spine–something likely to happen while using the knife to cut something-would disengage it. This would obviously be an obvious design flaw an experienced company would be unlikely to make, so what am I missing, how does it work? Christopher – the lock actually engages when your finger or thumb pushes it toward the blade. Disengaging actually takes a fingernail to pull it back away from the handle. It won’t happen on accident. In fact, gripping the knife properly virtually guarantees that it will remain engaged. Mike ….. I’ve always been curious about this piece. Nice review BTW. In your opinion what knife would you pocket…..the CQC-7bw by Emerson or this one? I think that is a fair comparison. Both knives label themselves as combat tactical. Both are similar in size and both have serrations. One of my main carries (never thought I’d say it) is the 7bw by Emerson. As someone who mainly uses a knife in my left hand the 7 is great for peeling through wood as I whittle. So what is it….the Gerber Covert or the 7bw??? Thanks. The 7BW is over an ounce heavier and has a pretty beefy handle. It’s also $80 more expensive, but Emerson does have a reputation for durability. Weight is a factor for me and I’d probably choose the Covert over the 7BW for true combat tactical carry primarily because I’m more likely to carry a knife that is less cumbersome. If you spend a decent amount of time whittling and want something more general purpose, stick with the 7BW. The edge isn’t serrated and the chisel blade grind is better suited for that kind of use. Neither one of them allow you to switch the pocket clip for you lefties. That’s a knock on what are both impressive blades. reversed the clip on one covert. This makes it easy to open with the same motion for either hand. I found the thumb studs little on the short side so I cut the heads off a 8p nail and inserted them into the hole in the studs. I found in gripping the knife engaging the lock is practically automatic. Great for peace of mind.